Tim and Juji Boyle retired from active missionary status in 2016 and returned to the US to live in the Penney Retirement Community in Penney Farms, Florida. Tim grew up in Arizona and first came to Japan in 1968 as a student with the East-West Center in Honolulu, Hawaii. He got his BS degree in physics at Arizona State University and had a year of graduate work at Florida State in meteorology that was ended by the draft in 1970. The way opened up, however, for him to come to Japan as a short-term missionary under the United Methodist Church, where he served for 3 years in Sapporo. Tim and Juji were married in 1974 in Sapporo, prior to Tim entering seminary, first at Asbury in Kentucky and then transferring for Fuller Seminary in California, where he received his MDiv and later DMin degrees. Tim and Juji served 2 Japanese-American churches in California (Altadena First Presbyterian and Christ United Methodist in Santa Maria) before returning to Japan in 1982 under a dual appointment with the Presbyterian Church USA and the United Methodist Church, first serving a rural Japanese church in Shintoku, Hokkaido for 1 term and then for 21 years at the Tsukuba Christian Center in "Tsukuba Science City" north of Tokyo. Tim finished out his missionary career with 2 years at the Burke Liberation Center in Osaka and 6 1/2 years at Kwansei Gakuin University, while Juji served as a medical counselor at the Shin'ai Home in Kobe. They have a cabin at Lake Nojiri in Nagano, where they will be spending their summers. 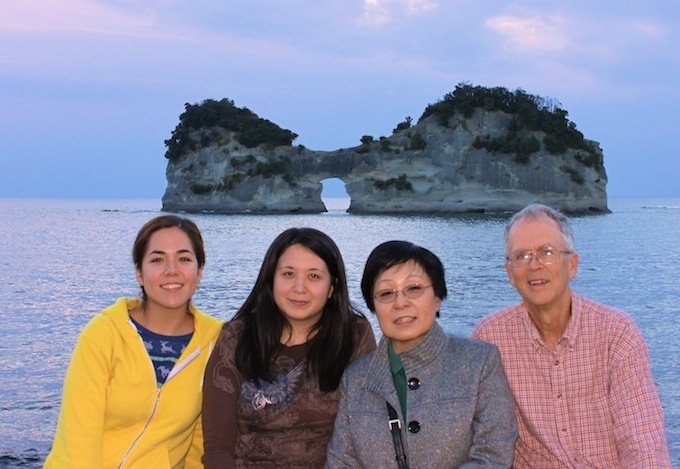 The picture above was taken in 2011 while both daughters, Lisa (center) and Jennifer (left), were visiting. Lisa is an acupuncturist and herbal medicine doctor in the Seattle area, while Jennifer is teaching at the Hokkaido Education University in Asahikawa, Hokkaido.